The word ‘pompier’ comes from the verb ‘pomper’ (to pump), referring to the manual fire pumps that were originally used at fires. ‘Sapeur’ probably comes from ‘saper’ meaning to undermine or destroy, as early firefighters often had little choice but to knock down whole buildings to stop a fire advancing. 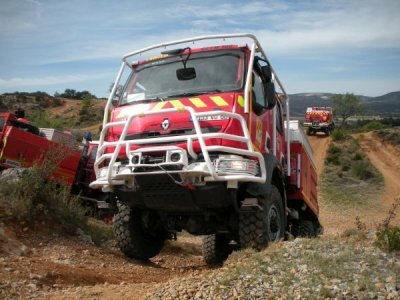 With approximately 250 thousand fire fighters throughout France, only 30 to 40 thousand are ‘professionals’ (SPP) on a regular salary – the rest are volunteers, (SPV) paid peanuts to risk their lives when fires break out! This is worth remembering next time you reach into your pocket to make a donation to a fire fighter event, or for the yearly Christmas calendar. In smaller communes, the emergency sirens of the ‘réseau national d’alerte’ ( RNA) blast out in short sequences to alert volunteer firemen to man their posts for fire or accident. However, most towns now use the more modern and somewhat quieter system of the beeper on the belt! My child is choking – Mon enfant s’étouffe. I’m bleeding – Je saigne beaucoup. I’m diabetic, I need insulin – Je suis diabétique, j’ai besoin d’insuline. My wife is having the baby, her water has broken – Ma femme accouche, le bébé arrive, la poche des eaux a percé.